AFTER SEVERAL WEEKS of Digital Television frustration, we've a new (EUR 38) Gigaboost antenna in the attic and a wireless interference-free way of watching Saorview. Although the better antenna resists electronic noise, it's still affected by sheets of rain. As suggested on Facebook, it's quite remarkable to watch government ministers endorsing technology easily disrupted by rainfall while living in a country reputed for its rainfall. For nearly a year, we operated our Saorview receivers with a puny indoor antenna. Then something happened (perhaps the transmission power was reduced) with both transmitters located west and north of us. The little antenna was woeful plus its reception pattern was easily blocked by 3G handset operations. 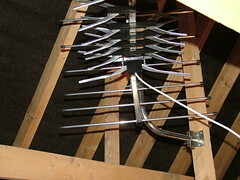 We had to get a different solution for the loft antenna (pictured) and Maplin in Limerick obliged. One note for DIYers who follow my blog: the Maplin antenna kits do not come with all the connectors you need to make the installation complete. I needed a small metal connector with exposed threads for the antenna cable. This should've been obvious to me because (1) I opened the box before paying for it and (2) the cashier asked me if I had all the coaxial parts. I needed another EUR 2.40 part and once I had it, we were sorted. Almost. We also had a problem with our Humax HD Fox T2 Saorview receiver (the pricey EUR 130 one) refusing to tune into any frequencies. It kept giving the "no signal or signal too weak" error message on both our analogue and digital television sets. Resetting the unit gave the "Humax" logo followed by the error message. I had to access the settings (password 0000), select all channels, delete all the chanels, and let the Humax retune all the frequencies. It did and now works perfectly again, powering a 14-year old cathode ray tube analogue television set's SD screen. The Humax receiver also plays from mains-powered USB drives. This means we can see photo albums by merely plugging in a keydrive. And Saorview also serves crystal clear audio via the RTE Choice channels. That audio might be the strongest performing part of the national broadcaster's digitial content suite.